A few years ago a friend sent me some sweet grass plugs from Montana, where she had been experimenting with wild grasses in harsh places. I planted them in the middle of my vegatable garden to keep them from cross pollinating.This year I was able to take four cuttings from my small sweet grass patch. 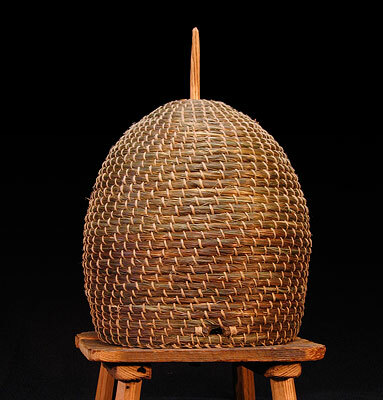 The results are what I'm calling the sweet grass collection.This finished skep is made of coiled sweet grass and hemp. The stand is made from old chestnut shingles with carved pine legs and top.